Historical facts concerning many established information on diverse fields continue to be unraveled to the astonishment of us all. One of these facts, previously little-known by many, is that Muslims had actually set foot on American soil centuries before Columbus’ illustrious expedition. We hope as you read ahead in this essay that some information and documents, excerpts from various sources, and the results of archeological excavations will demonstrate the truth of the aforementioned proposition. Did the Companions of the Prophet go to America? Research conducted in the West during the twentieth century has proven the existence of Muslims on the American mainland approximately seven centuries before Christopher Columbus. Similarly, archeological excavations, linguistic, and philological analyses of languages and settlement names in the region, the fact that coins, household tools and other utensils were discovered there that were similar to those of the Abbasids in the eighth and ninth centuries are all justifications of the theory that Muslims, beginning from 650 CE, made their way to the continent for settlement, during which time they erected mosques and schools, leaving a prolonged impact on the natives, i.e. American Indians. The Islamic sources carry no information as regards Muslim settlement in America, although research undertaken by Professor Barry Fell of Harvard University confirms that Muslims reached the continent at the time of Uthman, the third Caliph, concomitantly indicating the significant possibility that some of the Companions could have arrived there as well. Many Western researchers acknowledge the famous map of Piri Reis as proof of Muslim presence in America long before the endeavors of Columbus, as it minutely comprises the map of America, as well as extremely accurate measurements of the distance between America and Africa. 1. Professor Barry Fell, retired lecturer from Harvard University and also a member of the American Academy of Science and Arts, the Royal Society, the Epigraphy Society and the Society of Scientific and Archeological Discoveries, is adamant about the arrival of Islam in America in the 650s,2 predicating this argument upon the Cufic calligraphy belonging to that era found in various diggings across America. If the words of Professor Fell have truth-value, then the Muslims had arrived in America during the era of Uthman, or at least that of Ali, the fourth caliph. Such information, however, is not found in Muslim sources. Professor Fell again uses the results of various archeological diggings undertaken across many regions in the states of Colorado, New Mexico, and Indiana to assert the construction of Muslim schools during 700-800 CE. Writings, drawings, and charts inscribed on rocks discovered in the most remote and untainted terrains of Western America are relics bestowed by the elementary and intermediate systems of Muslim education at the time. These documents were written in the old Cufic letters of North African Arabic, covering subjects such as reading, writing, arithmetic, religion, history, geography, mathematics, astronomy, and navigation. The descendants of these settlers are thought to be the current native tribes of Iroquois, Algonquin, Anasazi, Hohokam, and Olmec. The Arabs, according to the findings of Professor Fell, settled in Nevada during the seventh and eighth centuries. The earlier existence of a school, which taught Islam and science, particularly navigation, has come to light following the archeological investigation undertaken by Professors Heizer and Baumhoff of California University around site WA 25 in Nevada. The excavations in Nevada have uncovered writings in Naskhi Arabic and Cufic style that are inscribed on rocks which carry information about this school (picture 3). The application of the mathematical formula “five diamonds equal an alif” (alif is the first letter of Arabic alphabet) may be seen in this picture (pictures 3b and 3c). The Arabic letters in pictures 3b and 3c, found amid excavations in Nevada, are in exactly the same style as North African Arabic. Again similarly, another rock was found in Nevada bearing the name “God”, the style of which is yet again reminiscent of the prevalent technique of seventh and eighth-century North Africa. The calligraphical similarities between various writing styles of the Prophet’s name over diverse periods, particularly those relating to Africa and America, found during archeological investigations are striking indeed. Figure A of picture 4 was found in al-Ain Lahag, Morocco and figure B in East Walker River; both are currently at the University of California. Figure C was discovered in Nevada and figures C and D were located in Churchill County and are also currently preserved at the University of California; likewise figure F was discovered in al-Haji Minoun, Morocco, while figure G, inscribed on ceramic, was revealed in al-Suk, Tripoli, Libya and figure H, at the University of California, was discovered at Cottonwood Canyon, while finally figure I was located on the border of Morocco and Libya. All these inscriptions belong to the eighth and ninth centuries, clearly illustrating the resemblance in style between North America and North Africa, as well as overtly suggesting a migration that occurred from Africa to America. 3. In the twelfth century the Athapcan Tribe, comprised of native Apaches and Navajos, raided the area inhabited by the Arabs, who either ended up fleeing or were exiled toward the South. These illiterate natives were spellbound by the schools founded by the Arabs, and, perhaps with the assistance of captives, attempted to imitate the same subjects, transforming the geometrical shapes into mythical beasts, which carried on for centuries. 4. Picture 5 is the Cufic writing found in 1951 in the White Mountains, close to the town of Benton on the border of Nevada. The words Shaytan maha mayan, i.e. the Devil is the source of all lies, have been written in a Cufic style peculiar to the seventh century. 5. Once more, a rock inscription belonging to post-650 CE, bearing the Cufic letters H-M-I-D of the word Hamid (picture 6), is another Arabic script discovered on the Atlata rocks in the Valley of Fire in Nevada. 6. While traveling from Malden to Cambridge in the state of Massachusetts in 1787 (on what is now RT. 16), the Reverend Thaddeus Mason Harris noticed some coins discovered by workers during road construction. The workers, not putting much value on these coins, presented him with a handful. Consequently, Harris decided to send these coins to the library of Harvard College for examination (picture 7). The study yielded that these were in fact Samarqand dirhams from the eighth and ninth centuries. As can be seen in the picture, the coins manifestly display the inscriptions La ilaha ill-Allah Muhammadun Rasulullah (There is no deity but God, and Muhammad is His Messenger) and Bismillah (in the name of God). 7. Picture 8 shows a piece of rock discovered in a cave in the region of Corinto in El Salvador, bearing the inscription Malaka Haji mi Malaya; this has been identified as belonging to the thirteenth century, suggesting a possible arrival of Muslims in South America, perhaps coming from somewhere near Indonesia. 7. During his second voyage, Columbus was told by the natives of Espanola (Haiti) of black men who had appeared on the island before him and they showed him the lances that had been left there by these Africans to support their assertions. The tips of the lances were of a metal, an alloy of gold, which they called guanin, a word which is semantically remarkably similar to the Arabic word ghina, meaning richness. Columbus had in fact brought some of this guanin back to Spain, recording that it was composed of 56.25% gold, 18.75% silver and 25% copper, ratios that were prevalent in African Guinea as standards for the processing of metals. 8. On his third voyage to the New World, Columbus visited Trinidad, where the sailors noticed the symmetrically patterned cotton and colorful handkerchiefs of the natives. Afterward, Columbus realized that the handkerchiefs, which the natives called almayzar, were all much the same in color, style, and use as the headscarves and waist bands used in Guinea. The word almayzar is Arabic, and denotes a cover, tie, apron, or skirt, and is a component of the regional costumes of the Moors, Arabs and, Berbers of North Africa, who had conquered Spain in the eighth century. Columbus observed that the local women wore cotton garments and wrote in astonishment that they had learned of the concept namus, i.e. chastity. In much the same vein, Hernan Cortes, another Spanish explorer, later recorded that the clothing of local women consisted of long veils and skirts decorated with ornaments that were similar to those of the Moors. Ferdinand, Columbus’ son, was also quick to notice the resemblance between the cotton dresses of the natives and the ornamented shawls fashioned by Moorish women in Granada. The cradles used by the natives, furthermore, very closely resembled those of North Africa. 9. Columbus recorded on 21 October 1492 that he had noticed a mosque on top of a mountain while sailing around Cibara on the northeast coast of Cuba. Relics of mosques carrying Qur’anic inscriptions on their minarets have been found in Cuba, Mexico, Texas, and Nevada since these times. 10. Leo Weiner, a well-known Harvard historian and linguist, stated in his book The Discovery of Africa and America, written in 1920, that Columbus was aware of the existence of Mandinka, an ethnic group of West Africa, in the New World. The same book also affirms that Columbus was aware that West African Muslims were living across North America, including the south, middle regions and Canada, as well as in the Caribbean, and that they had marital and commercial ties with the native tribes of Iroque and Algonquin. 11. A preponderance of the voyages embarked upon by Columbus and other Spanish and Portuguese explorers toward the other side of the Atlantic were undertaken only in the light of the geographical and navigational knowledge prepared by Muslims. Al-Masudi’s (871-957 CE) work Muruj’uz-Zahab, for instance, was written with this sort of data compiled by Muslim traders from across Africa and Asia. Two of Columbus’ captains on the first voyage, in actual fact, were Muslims: Martin Alonso Pinzon was in charge of the Pinta, while his brother Vicente Yanez Pinzon was the designated captain of Nina; both were from the Moroccan Marinid dynasty, descendants of Sultan Abu Zayan Muhammad III (r. 1362-1366). Formerly well-to-do ship riggers, they assisted Columbus in organizing his voyage of exploration, preparing the Santa Maria, the flagship, and covering all its expenses. 12. Christopher Columbus has recorded the custom of nose piercing, which used to be and still popular in the Middle Eastern and Arab countries, as being prevalent in some islands across the Atlantic also mentions the writing of letters in Arabic. 13. In the account of sixteenth century missionaries in America, the local copper mines, found particularly in Virginia, Tennessee, and Wisconsin were not operated by the natives, but instead by people from the Middle East, towards whom the natives nurtured a profound sympathy. 14. A sum of 565 names, 484 in America and 81 in Canada, of villages, towns, cities, mountains, lakes, rivers and etcetera, are etymologically Arabic, designated by locals long before the arrival of Columbus. Many of these names are in fact the same as names of Islamic places; Mecca in Indiana, Medina in Idaho, Medina in New York, Medina and Hazen in North Dakota, Medina in Ohio, Medina in Tennessee, Medina in Texas, Medina and Arva in Ontario, Mahomet in Illinois and Mona in Utah, are just a few noticeable names at the outset. A closer analysis of the names of native tribes will immediately reveal their Arabic etymological ancestry; Anasazi, Apache, Arawak, Arikana, Chavin, Cherokee, Cree, Hohokam, Hupa, Hopi, Makkah, Mohician, Mohawk, Nazca, Zulu, and Zuni are only a few. Archeological excavations conducted throughout North America and North Africa reveal a corresponding architectural resemblance between ninth century buildings. The structure of a Berber house of the Atlas Mountains, Morocco (picture 9), for instance, is exactly the same as that of a house in New Mexico (picture 10). 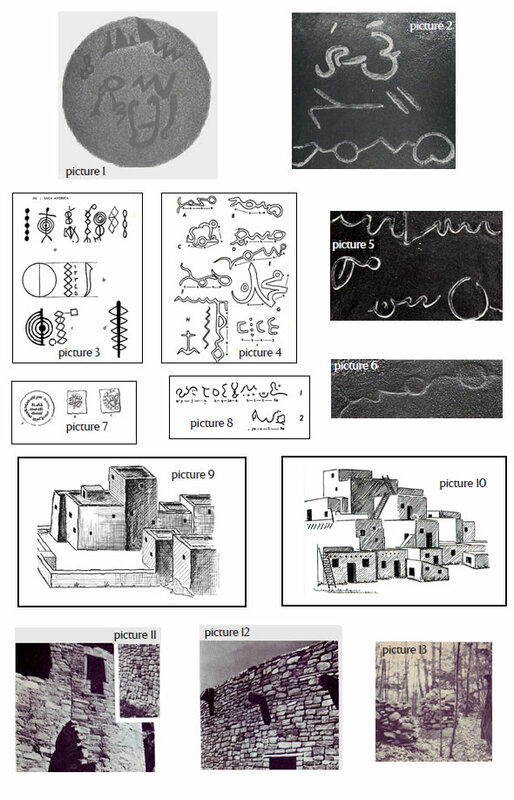 The same similarity can be traced between the Castle of Montezuma discovered in Arizona and the remnants found in Mesa Verde in Colorado and the general structure of Berber buildings (picture 11-12). The research undertaken by Professor Cyrus Thomas of the Smithsonian Institute shows that a small cabin built from piles of rock found in Ellenville, New York is virtually the same as the cabin, again of rock, found around Aqabah, Southern Arabia, both of which are thought to have been built around the start of the eighth century (picture 13). The pervasiveness of many Islamic words across the continent prior to European influx is verified by the following terms discovered in the regions currently known as New England and Nova Scotia, in America and Canada respectively. Fell pointed to some words as example of Arabic influence on Native Americans. All of the words listed below are derived from the Arabic language. However, time had eroded their original meanings and most are not used in Arabic today. The last Muslim stronghold in Spain, Granada, fell just before the Spanish Inquisition was established in 1492. Non-Christians were forced to either convert to Catholicism to save themselves from the tyranny of the Inquisition or were exiled from the country. Documents exist which prove the existence of immigrant Muslims in Spanish America before 1550. In 1539 an edict from Spanish King Charles V was put into practice which forbade the immigration of Muslims to settlements in the West. This edict was later expanded to expel all Muslims from overseas Spanish colonies in 1543. The existence of Muslims in overseas islands and regions was known along with the fact that the Spanish king issued such an edict. Again, in many Islamic sources, it is noted that Muslims living in Spain and North Africa made overseas voyages during the Andalusia period. Scientific research on this subject will bring out many documents into the daylight, documents which have escaped the notice of both Muslims in America and those throughout the world, which will perhaps serve, in the future if not immediately, as a starting point for a re-evaluation of the history of America. 1. Trento, Salvatore Michael. The Search for Lost America, p.15 Penguin Books, New York: 1978. 2. Fell, Dr. Barry. Saga America, p. 190, Time Books, New York: 1980. 7. Teacher, John Boyd. Christopher Columbus, p. 380, New York: 1950. 8. Columbus, Ferdinand. The Life of Admiral Christopher Columbus, p. 232 Rutgers Uni. Press, 1959. 9. Obregon, Mauricio. The Columbus Papers, The Barcelona Letter of 1493. 10. The Landfall Controversy, and the Indian Guides, McMillan Co., New York: 1991. 11. Weiner, Dr. Leo. Africa and the Discovery of America, Vol.2 p. 365-366 Philadelphia: 1920. 13. Trento, 1978, p. 23. 17. Trento, 1978, p. 15. 18. Fell, 1980. p. 400-403.